The search for the best airbrush for your miniatures can be rather arduous. When researching for this article I came across so many complexities, and that’s from the point of view of someone who has a good insight into Airbrushing. There are simply too many variations on the many options out there, how do you know you are making the right purchase? Especially when you’re committing so much money. Not only is it hard to navigate your way into airbrushing with all the new terminology to pick up, but when it comes to choosing the right airbrush there are so many considerations without clear direct comparisons across brands and models. To make the commitment that much simpler for you, we’ve broken this all down for you below, nice and simple like. 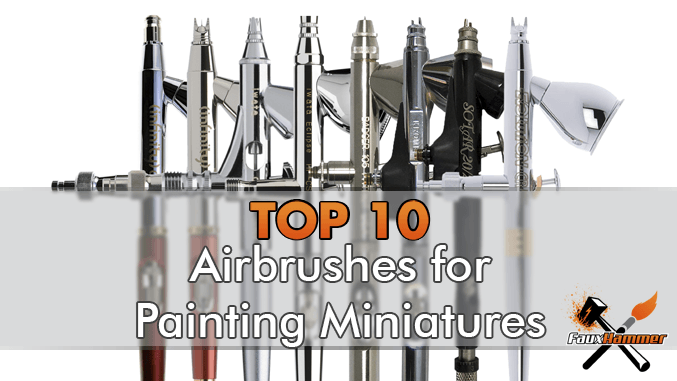 No matter if you are new to airbrushing mini’s or have had some experience, there are some options for you in this list. 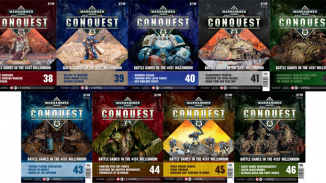 The list below are the 10 most popular brushes for miniature painters from the wargames community. 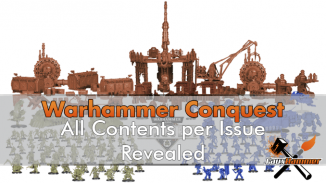 The list was compiled by surveying over 600 miniature painters who are also airbrush users. 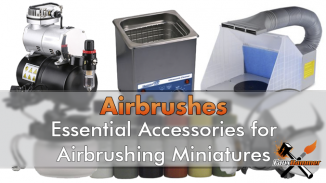 The Best Airbrush for Painting Miniatures & Wargames Models – Selecting the Best Airbrush. If this is your ‘First’ Airbrush, I recommend ignoring this article for now and reading our Best Beginner Airbrush for Miniatures and Models Article. In Summary; that one advises not spending much money on your first Airbrush and just picking up a cheap starter kit on eBay or Amazon, which will include your Compressor and a very basic Airbrush. This is a legitimate option and actually came in as number 12 on our survey. With Airbrushing comes a lot of maintenance, otherwise, it can end up destroyed after a single use. It’s best to learn this on an airbrush you picked up for next to nothing than risk trashing something expensive. Also, if all you ever want to do with an airbrush is Priming, base-coating or at most some Zenithial shading. Then you won’t ever need more than a cheapo option anyway. Don’t worry, I’ll keep this simple and focused toward miniature painters, you don’t need to know everything. Just enough so you can make the right considerations for yourself and choose the best option. In very general terms this is the primary component which controls the width of the cone of spray from your Airbrush. A smaller nozzle equals a smaller spray cone, a larger nozzle, a larger cone. think of this like you think of your brush sizes, the lower the number, the more detailed the work you will be doing with it. But there’s something else to consider here, the smaller the nozzle the more likely it is to clog up with paint. Acrylic paints which most of us use, aren’t directly suited to airbrush painting, this is why many companies now offer an Airbrush range. But even then, the smaller nozzles are still more prone to clogging. As you gain more experience, You will find the balance as to how much thinner and paint you need in order to get the right flow and avoid clogging without making the paint too thin. But this is one of the reasons that the “detail” work is a more experience technique than simple priming and base coating. Most people suggest that if you are just priming, base-coating or Zenithal Shading, 0.5 mm or 0.4 mm Nozzles are best. If you want to do more detailed work like recess shading or spot highlights. you are looking at a 0.2 mm or 0.15 mm Nozzle. 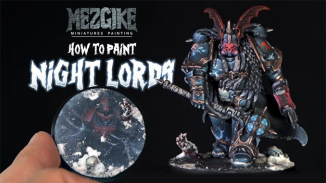 For Miniature painters, this is really simple. You want a gravity fed airbrush. This is the one with a cup on the top. You simply pour paint in, mix with me thinner and spray. You can also get Side-Fed which is just like Gravity-Fed, but the cup is mounted into the side of the airbrush. I’ve had one of these and don’t see the benefit over Gravity-Fed. If anything, it’s just a lot harder to clean. The final main type is Syphon Fed. This is where a bottle or cup attaches below the airbrush and the paint is syphoned up by air pressure. I’ve had one of these too and unless you are priming hundreds of mini’s in one go. it’s overkill. Most of the time I’ve had more paint left in the bottle which the syphon hose can’t reach than I’d even put in a Gravity-Fed airbrush. The most common selection here is a dual-action finger trigger (with one exception). This sits on the top of the brush. Push this down to release air, pull it back to release paint. The further you push it down the more air is released, the further you pull back the more paint is released. With the air, I’ve never found use in having such analogous levels of control. My compressor controls the amount of air released so I just hammer on the air. But having a comfortable and smooth pull-back motion or a method to stop the needle coming back at a set level is key to getting the correct amount of paint you need. Along with the trigger, you can get some additional controls. 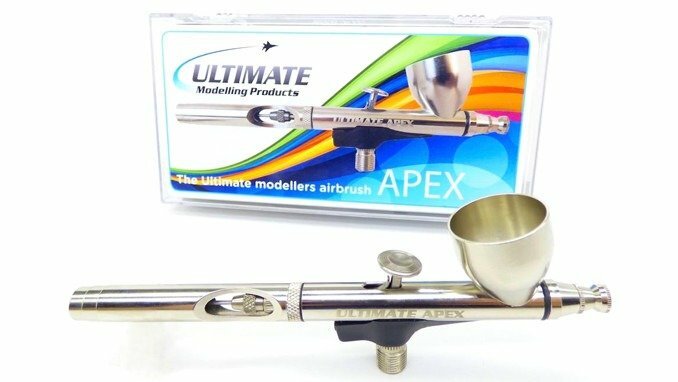 Most of your more popular airbrushes will come with a lock which prevents you from pulling back the needle too far, ensuring you don’t expel more paint than you intend. I’ve never had a use for this, but it could be good for a beginner when performing detail work. Aside from this, you can also get brushes with a screw on the front, normally below the paint cup (though none of these is on our list). This will narrow the tube which the air flows through, again limiting the speed of paint you express through the nozzle. You can, of course. buy a separate line adapter for this function if you feel like you would need it and if you like to have options (of having more dials and knobs), it’s something you can consider. And now a key point. The below list will define the “body” of the airbrush only. But just buying that body will not ensure you are using the same thing as your favourite pro painter you’re watching tutorials from. Many manufactures will sell you the same body with different Needle/Nozzle sizes. (then there are many add-ons, some third-party ones. which I’m not covering here) Some will offer a selection of Nozzle conversion kits with your purchase. Others may offer the same brush in different colours or finishes (if that matters to you). But essentially Once you have picked the body you want based on what available features are right for you, you can then look at the different purchase options available. 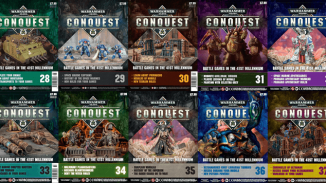 Whilst the below is a top 10 list ranked by popularity within the miniature painting community. 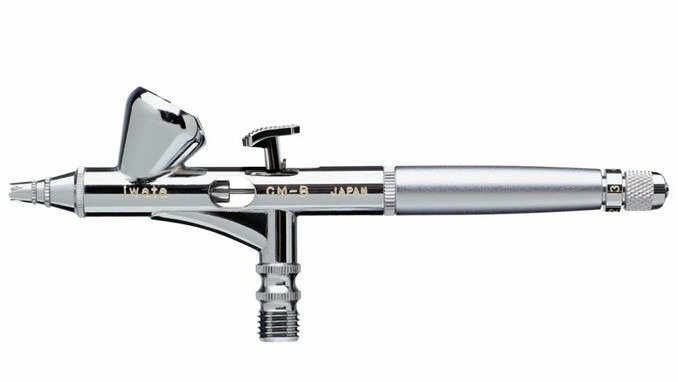 You need to consider your personal needs when selecting an Airbrush. The main ones being, what do you want to do with it, how much effort do you want to put into maintaining it and how easy is it to get replacement parts if needed? Like with finding the Best Brushes, a good airbrush does not make a good Airbrush Painter. But if you are trying to accomplish a new technique or better standard, a bad airbrush can hold you back. Full Disclosure: This product uses affiliate links. The Harder & Steenbeck Infinity CRPlus is a true up-and-comer which is likely to be in the top 3 next year (I’ll be shocked if it isn’t!). The Infinity (number 3 on our list ranked by popularity) is selling out at Harder & Steenbeck. The Infinity CRplus is the replacement for the base Infinity model. The CRplus features a Chrome Plated body and PTFE Seals (to avoid solvent wear). It’s not lacking in controls either. the quick fix system on the back allows you to quickly lock how far you can pull back the trigger, and you can fully release this in an instant. You can even control the resistance of the trigger too. The needle guard is quick release and the cup can be changed out from 2 ml to 5 ml. With all the quick snap on components, this is really easy to clean between uses, but the full teardown is a touch trickier than most. This is an expensive, top of the line brush, a bit too much to chew for most miniature painters. Harder & Steenbeck are a German company so you will benefit from that excellent German level of engineering quality, but this will lead to higher costs outside of Europena territories. As for purchase options, these are almost as plentiful as the variations available. The Infinity CRplus 0,15, 0,2 & 0,4 come with 0.15mm, 0.2mm and 0.4mm needles respectively. 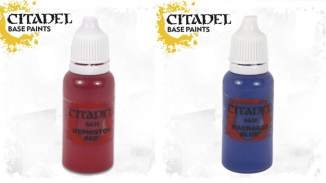 The 0,4 also upgrades the changeable paint cup from 2ml to 5ml. They also offer two different two-in-one kits, one with the 0.15 and 0.4mm nozzles, the other with the 0.2 & 0.4mm nozzles. Both of these come with the 2ml and 5ml paint cups. There are a good amount of purchase options for this. and remember no matter which you get, you can always spend a bit more money later to get the different needle sizes and cup sizes if you wish. In any of these set’s, you get a really good instruction manual detailing how to do specific things to control your brush. 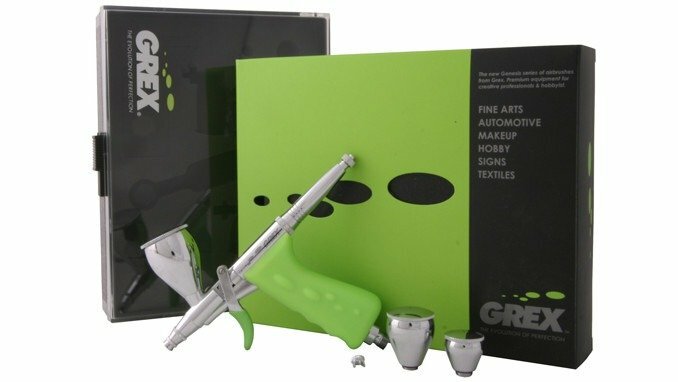 With its almost luminous Green Handle, Chrome Body and Pistol Grip trigger – This Airbrush certainly has the most interesting look of all of the models on this list. The Grex Tritium or as it’s more commonly known, the TG, is an excellent all-round Airbrush and perfect for those of us with hands prone to aching. The Pistol Grip Trigger is still a dual-action trigger. Pull back slightly and you get air. Once the air is fully on, pulling back further engages the needle which will increase paint flow the further you pull back. You won’t have the analogous control of airflow that you get with the press-down-pull-back finger triggers. but you can always adjust airflow pressure on your compressor or pick up the Grex Micro Air Control valve for even more precise control than your finger could give you. Another cool feature of the Grex TG is the magnetic quick release needle cap and crown, which can be swapped from in-use on the front to storage on the back. The set comes with 2 ml, 7ml & 15 ml paint cups which you can swap out as needed (you can even buy a 50 ml add-on if needed). The website even suggests you can use the bare threaded cup recess as an integrated cup when you need minute amounts of paint. Proudly American Made (just Like Robocop and Robocop 2) so you know this will be a heavy hitter. But unfortunately, it seems that picking it up outside of the US will mean it’s hard to come by, more expensive when you can find it or if you need to import it, you’re responsible for import duties. Thankfully the purchase “options” or “variations” are nice and simple. The Grex Tritium, TG2, TG3 and TG5 Come with 0.2mm, 0.3mm and 0.5mm needles respectively. There’s no 2 in 1 option but you can buy the conversion kits for any other size. you can even get a 0.7mm conversion kit. additionally, you can pick up a 50mm paint cup. The best accessory Grex offers is the Micro Air Control valve, which fastens into your airline to restrict air flow and put the control of airflow back into your hand. This can also be used with any airbrush. Whilst the Pistol Grip may put some off for not looking like any other airbrush on this list, It really isn’t a barrier to airbrushing. Especially when used alongside the Micro Air Control valve. Simply purchase a starter kit and add on some accessories as needed. Iwata’s first entry on this list is in 8th place for probably one reason. It’s expensive, very expensive. In fact, it’s over double the price of some airbrushes on this list, three times the price of others. 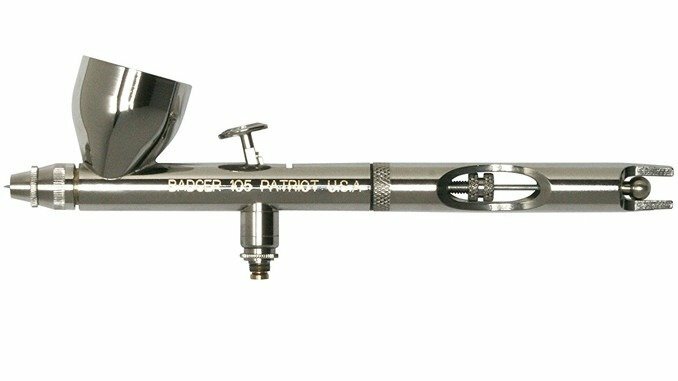 This Gravity fed airbrush features a Fixed 1.5ml (0.05fl. oz) cup with no room for expansion. 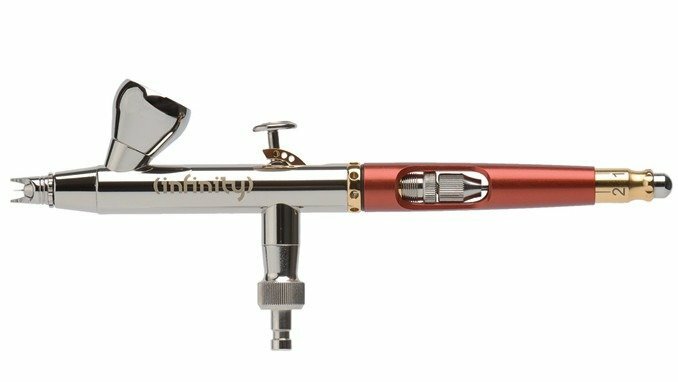 It has your standard dual-action finger trigger and a quick release trigger stop, this is a cool feature lets you turn a dial on the back of the airbrush to limit how far you can pull back the needle. A couple of other old-school features (or lack of features) are the screw in needle cap and it’s lack of a cutaway in the rear of the handle (which you can buy separately) which would allow you to easily pull back the needle for cleaning. On the point of cleaning, users have said it is one of the more difficult brushes to maintain, not restrictively so, just marginally trickier. What it does feature is is a 0.18 mm needle (without any conversion options I can find) and an incredible reputation of being one of the best detail airbrushes available. It does one job and it does it well. Users of the Iwata Custom Micron CM-B have said that after using this model they can’t even consider using anything else. So, Once you go CM-B you don’t go back. We jump from the most expensive model on our list to the cheapest. A brush with an interesting history too. Originally Designed by Thayer & Chandler who went out of business in 1998, The product line was subsequently bought by Badger in 2000 Who produced this brush under the name “Omni 4000”. I’m not sure what happened then, but now it’s rebranded as the Apex. This brush is sold by Ultimate Modelling products and I believe it is still Badger who makes it. Featuring your standard dual-action finger trigger and solvent resistant ‘O’ rings. It has adjustable trigger tension a reversible needle cover to either expose the needle for close up detail work or protect it the rest of the time. Strangely I was unable to find any detail on the paint cup volume, so I’ll just say it’s large. The brush works with a single 0.35mm nozzle it really fits the bill as a great all-rounder. If you are simply looking for something as a beginner brush and don’t want to trust the Chinese built Knock off products or you want a secondary airbrush as a general workhorse. This is the model for you. Once again the purchase options are really simpl, and you can buy spares of literally any part, direct from Ultimate Hobby Products. About time Badger properly showed up on this list, Badger makes great airbrushes and feature 3 times on this list (4 if you include the ultimate Apex). Let’s just say straight off. Badger make much better Airbrushes than they do websites. Trying to do any research for this brush was like travelling back to 1998 when looking at Badger’s own website. Maybe early 2000’s for their Renegade series sister site. It was painful! Honestly, I can’t even tell if the Renegade Krome is in production anymore as I simply cannot find it on Badger. But you can still get them from Amazon. The Renegade Krome has a fixed 10ml paint cup, access to the needle and adjustable trigger tension. It also features a quick stop dial for the needle. The trigger action on this model is loved as one of the more intuitive dual action systems allowing for great control. Once again, simple purchase option, it comes as a 2-in-1 set with a 0.21mm and 0.33mm nozzles. Much like the Infinity, the Evolution CRplus is the top of the Evolution range. The Evolution rage itself is the mid-range offering from Hader & Steenbeck. It’s been around for a while and at a much lower cost, it’s much higher up on our list than it probably deserves over the Infinity CRplus. but it is simply more popular. 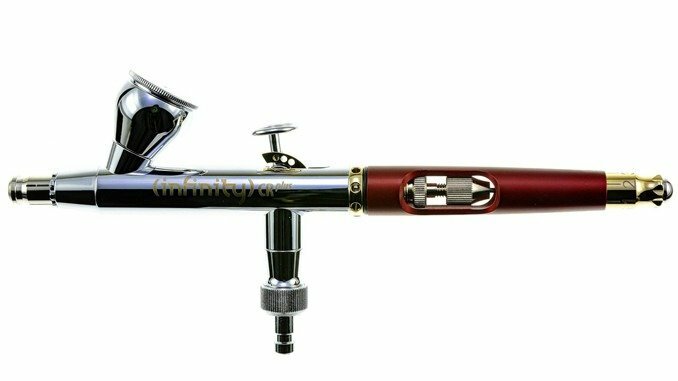 The infinity, truly is a great mid-range airbrush. On the outset, you can see the Nozzle cap is different from the Infinity, but within this, the nozzle system is the same, as are the paint cups. The Evolution does not have the same needle cutaway as the Infinity nor does it have the quick stop for the trigger. The finish is also Nickel on the Evolution which means it will wear over time as opposed to the Infinity which will look brand new after years of use. The purchase options are the same as that of the Infinity. 3 individual needles sizes or a two-in-one box set. Does it come in Black? Finally one of what I consider to be a sexier Airbrush. This model has a standard set of features. The dual action finger trigger, quick release trigger stop, a quick release needle guard and a snap on crown cap. The fixed paint cup holds 2.5ml of paint. And that’s about as much as I can tell you. This is what frustrates people about buying airbrushes, the inconsistency of details. Not only are there different versions of most of the models and different size needles. 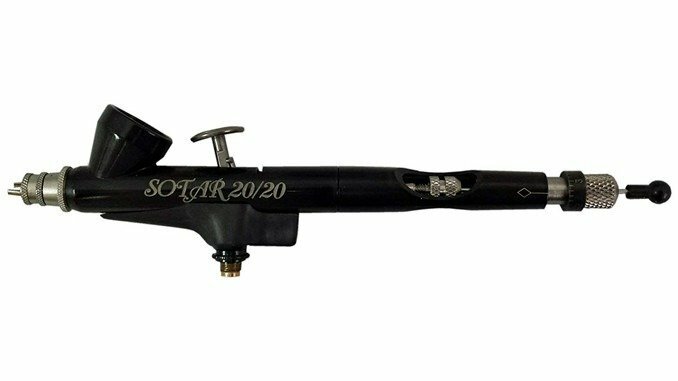 But the Badger Sotar 20/20 doesn’t even follow the standard size names for the nozzles, usually defined by its diameter in mm. Instead, the Badger Sotar needles (which already have a unique look due too the plastic handle on the back end) are defined as (1) Fine, (2) Medium and (3) Large. This is lauded as a great airbrush, but just like Badger’s archaic website, figuring out these uniquely named needle sizes and which has a better application for miniature painters was so frustrating, I gave up. Update: Chris from The Hobby Hangout Facebook Group has given us the sizes (1) Fine is 0.2mm. (2) Medium is 0.3mm and (3) Large is 0.5mm. You can buy the kit with the fine needle and get conversion kits for the different sizes. 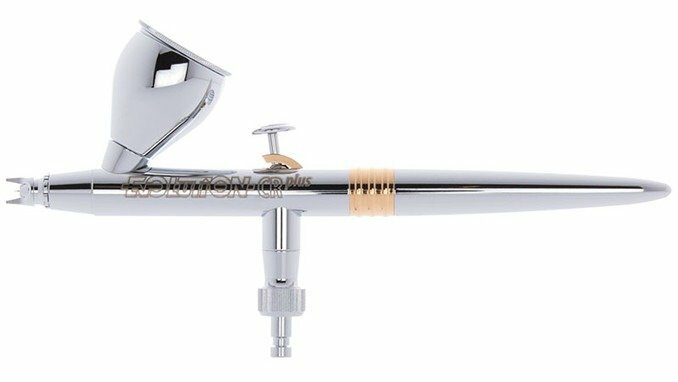 We’re in the end game now with the 3 most popular airbrushes. If you’ve skipped to the top 3, go back and check out number 10, which is the new version of the Infinity Solo. The Infinity Solo itself is an end-of-life product and Hader & Steinbeck are only selling them whilst stocks last. This base Infinity Solo comes with a 0.15mm nozzle which makes it one of the finer airbrushes on this list. Perfect for those of you who want to airbrush a whole model almost entirely. But it’s not for the beginner, you need to know how to properly thin your paints to use this as it is so fine it is prone to clogging with acrylics. It also has a 2ml paint cup. This is however interchangeable. Like the CRplus it has a Quick Fix Trigger Stop to prevent you from pulling the needle back too far. It also has a cutaway for quick access to the needle release and torsion system, allowing you to adjust the tension in the trigger for more accurate control. It has a crown cap for super fine detail work whilst still protecting the needle. It’s also nickel plated which can be an issue for those with nickel allergies, and the finish will wear down over time. Whereas the CRplus is chrome meaning it will look new for years. You can buy the Solo which is the superfine 0.15 mm nozzle or you can get this as a two-in-one set which also gives you a 0.4mm nozzle and a 5ml paint cup. If you can find this a discount, you can get yourself a best-in-class airbrush at a bargain. But if you’re happy spending retail prices, get the Infinity CRplus. Comfortable, reliable & cost-effective are how Badger themselves describe this brush, and they aren’t wrong. it’s a true patriot. It’s also simple. The second most popular airbrush for miniature painters is in this place because it’s a trusty workhorse that simply won’t let you down. This is possibly the perfect option for those of you stepping up from the cheap airbrush set you may have picked up online. Oh, and did I mention that Badger Airbrushes come with a lifetime warranty on their seals and labour? Just pay for shipping back to badger and it will essentially be refurbished for you whenever you wish. It has everything you need from novice level to some more advanced techniques. A cutaway for access to the needle clamp, minimal spare parts and easy maintenance. For purchase options, it’s as simple as it gets. it has a single 0.5 mm needle/nozzle system. Like the Sotar, I can’t find any details online as to what size this needle is in comparison to the others. However it is lauded by the miniature painting community, so it surely does the majority of jobs. There is also the Extreme model which features an air flow regulation screw and a longer trigger for more accurate control. but the more popular model is the base Patriot 105. If you know the nozzle size. please let me know in the comments. Update: Thanks to Matthew in the Comments & Chris from The Hobby Hangout Facebook Group we now have the Nozzle Size. 0.5 on the Patriot 105 and 0.3mm on the Patriot 105 Extreme. There are also conversion kits for different sizes available online. The below models were all voted for by the miniature community as a particular individual’s brush of choice. Dissapointingly, none of the Paasche models made the Top 10. There are a range of great brushes here from top end to budget workhorses,. each is worth your time and consideration when choosing your next brush. Ok, so I know it looks like I’ve paired up 2 airbrushes into one category, but the only difference between the HP-BS & HP-CS is the size of the fixed paint cup (do you see how airbrush model names can be confusing?). The HP-CS having a 7ml paint cup and the HP-BS having a 1.5ml paint cup. There’s no price difference, so, unless you have a specific application for this ultrafine airbrush, it’s probably worth just picking up the HP-CS for the option of the larger cup which you can always just put less paint in. You can get the conversion kits online to swap out the needle when necessary. It has a dual action finger trigger, cutaway for needle access and a quick release compression fit needle cap. It does, however, lack some of the more advanced features such as a quick stop for the trigger or any kind of torsion system to adjust the tension of the trigger. This is a mid-range airbrush which potentially has everything that the majority of miniature painters are looking for. Also, it won’t break the bank like some of the more specialist options. It’s not hard to see why this is the most popular pick on the list. 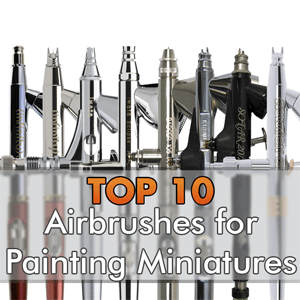 Much like the top 10 best brushes, choosing an airbrush is down to personal preference, and the highest quality, most feature-rich airbrush will not make you an instant master at airbrushing. But unlike selecting brushes, choosing an airbrush is much more down to personal needs and your skill level. Oh, and your budget. 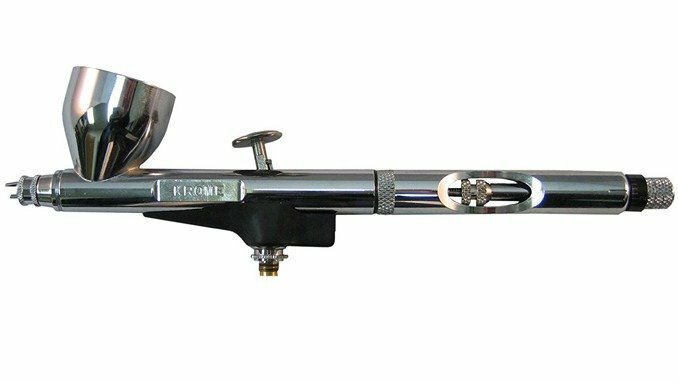 If you are a complete beginner, read our best beginner airbrush article and maybe just get something cheap with a compressor before you jump in the deep end spending hundreds of your hard earned cash. Sure, it will last weeks not years. My first one didn’t even last until I could use it! But they cost next to nothing to replace the whole brush. If you are really against the eBay knock-off models then one of the workhorses from the list above will be perfect for your first model. If you have some beginner or intermediate skill and want to move up, then something with optional nozzles is a logical next step. This will let you have the benefit of giving a quick primer or base coat and also lets you try out the precision work. just remember you will need to start using propper thinners and drying retarders with the smaller size nozzles. If you are intermediate to advanced with airbrushing and paint all of your minis with some level of fine airbrush work, you already have your paint thinning supplies, a good technique and you have the budget! Then you want to be looking at the best-in-class models. No matter what you select, every brush on the above list would be considered a great choice. Just make sure you are making the right choice for your personal level and intent. 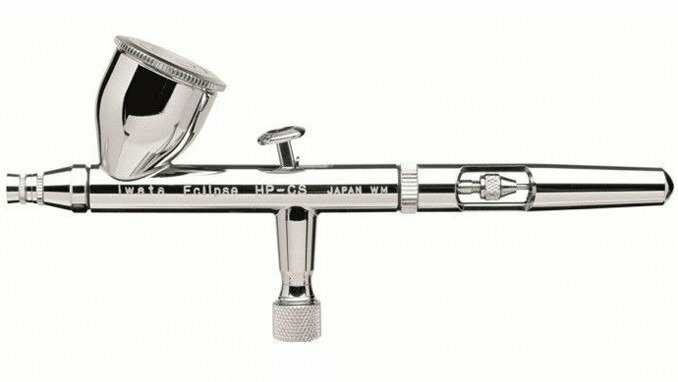 Once you have selected your airbrush, have a look at our list of essential accessories that you will want to go along with it. What did you think of this article? please let me know in the comments. Would you like me to do some more top 10’s? If so, what? See our Existing TOP 10 Articles by following this link. If you like what I’m doing here you could really help encourage more content with a share on any social media platform. Badger patriot is 0.5 mm. It has upgrade kits to change nozzle size though made by lot of manufactorers because of how popular it is.